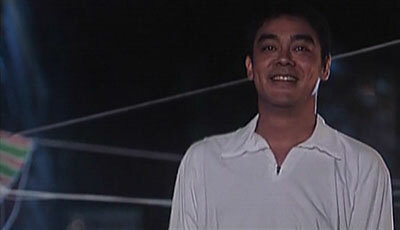 Beyond Hypothermia was the first production to come out of the acclaimed Milkyway Image, founded by Johnnie To and Wai Ka-Fai that very same year. To directed A Moment Of Romance 3 the same year so perhaps that is why we didn't see him straight back in the director's chair for Milkyway's very first product. Instead To held out until for 2 years though, giving us the classic A Hero Never Dies and for Beyond Hypothermia, Patrick Leung, having previously co-written and co-produced John Woo's bleak Bullet In The Head, was brought in to helm his second feature (first being the boxing-drama Somebody Up There Likes Me). During its initial stages, Milkyway seemed to partly be on a mission to bring back heroic bloodshed to Hong Kong cinema now that John Woo, Ringo Lam AND Tsui Hark had left for Hollywood. Beyond Hypothermia rings true in terms of that but is clearly an infant, one that grew big very fast by the time Johnnie To himself made A Hero Never Dies. In what could be seen as a tribute to John, Patrick Leung plants the themes found in heroic bloodshed, and its various aspects, but also with varied results. Themes of assassins with a haunted soul, only existing in a reality, of no identity, that's been created around them and looking for salvation....yep...Beyond Hypothermia is that way a lot like The Killer, only lacking the final polished flair that John Woo was able to bring when also having Chow Yun-Fat on board. But seeing as this is 1996, a lot feels different (and 1997 was just around the corner) and Leung isn't out to emulate Woo's style as such, just pay a humble tribute to such themes that made Woo's action movies such favourites in Hong Kong and eventually overseas. Patrick would go on to further himself greatly in that regard, just as producer Johnnie To himself did with his choosen Milkyway style, with Task Force in 1997 (which was produced by John Woo). So what Leung brings with that choosen theme of an assassin trying to find salvation, or rather warmth, is probably the most successful, and a true successful, aspect of Beyond Hypothermia. It isn't much of stretch to buy into the image of a cold blooded female assassin when it comes in the form of Wu Chien-Lien. She comes through with a accomplished subtle combination of longing while also being capable of the most heinous acts of violence (none is spared, don't say I didn't warn you...). When Leung is subsequently focusing on that choosen source of warmth for her, essayed by Lau Ching Wan, he produces a very suitable understated romance, which clearly is, and you should really recognize this as soon as the movie opens, plagued with a pessimistic tone. Wu, without a past anymore, gets to enter a world she never knew and she greets it like a child; unsure of herself, and ultimately she can't fully transfer herself to that desired place. She exists in two realities, which is why she makes choices that seem disjointed. That is also an aspect that runs through characters in the film, even the reformed Long Shek, as his kindness may prove to be poured on way too much. I have little to argue against Leung's handling of Wu and Lau's story as its quite captivating to watch these two actors, one truly excelling at the cold and the other at the warmth. Roy Szeto's script does feature some overbearing and too spot on dialogue at times and even the hypothermia angle to Wu's character only functions as minor symbolism. If you strip away that from her, you would still have someone with the same inner conflicts and desires. Speaking of stripping away, Beyond Hypothermia does of course have a gangster plot, where staples of the genre, that rarely were made good by anyone outside of Woo, Lam and Hark, sinks the film into a mediocre state partly. 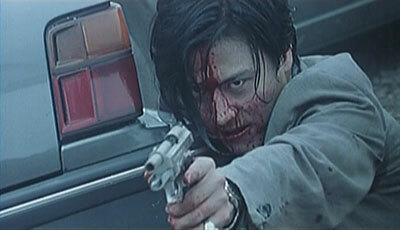 There's the odd element here and there that seem way too cool for the film, especially in regards to some of the ballistic action but it's primarily when introducing Korean gangster Yichin (Han Sang-Woo) that the film unexpectedly, and sadly, feels like any other heroic bloodshed gangster saga, only with better cinematography (courtesy of Arthur Wong). As written, you probably don't need Yichin to be any more than on a path of vengeance but even with that simplicity, Han Sang-Woo's performance is incredibly forced. Bearing a resemblance to Milkyway regular supporting player Raymond Wong, it's also very easy to switch those two actors and you would have the same effect. Plus the fact that, of all things, a stupid haircut gets in the way, mirroring this subplot against that of Lau and Wu's, makes Beyond Hypothermia, just as its characters, disjointed but captivating in parts. And for the action itself, which goes some incredibly bloody places, I think the same narrative pro's and con's comes with Yuen Bun and Yuen Tak's work as well. It's technically fairly well put together, featuring a more messy and chaotic ballistic nature but only works when played out against the most interesting story in the film. It was just not bound to enhance the lesser part of the film. Patrick Leung shouldn't be ashamed of Beyond Hypothermia however as it kicked off the Milkyway machine in a good way. Captivating character drama with well-executed action drives the movie partially home but perhaps it would've been best to have Johnnie To helm this first one as he clearly had some thought, at least later, of how to present heroic bloodshed to a late 90s audience. As it stands, Beyond Hypothermia, a less discussed effort since it's not widely available on home video, has actors that shines but the final product is clearly not thoroughly polished. Mainland label Guang Dong Tung Ah's have now re-issued their previously out of print dvd but this review is solely based on the first version although the discs most certainly are the same except for the cover art. Suspicions arose back then that this may have been a joint venture with Mei Ah in Hong Kong, due to similar logos for one, and NOW, it actually has the Mei Ah logo on the dvd front! Regardless, it still stands, currently, as the only subtitled version on dvd with the intended, albeit post synced, language track (don't be surprised if a 16:9 remaster turns up in Hong Kong very soon though). The transfer, framed at 1.74:1, will have to rank as acceptable but very much feels like an older Mei Ah disc. The print is very clean but it comes with an overall smeary look and lacking in detail and sharpness. The Cantonese/Korean Dolby Digital 2.0 track sounds mono all the way and while a little rough, does its job ok. The disc defaults to the Mandarin/Korean 2.0 dub so you'll have to switch manually. Being derived from the theatrical print, the English/Chinese burned in subtitles are our only option. They feature little spelling and grammar errors and are readable at all times though. There's no setup menu of any kind which also means no extras.